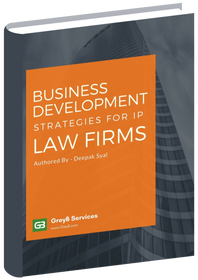 Smart Business Development For IP Law Firms: How to Use Data to Increase Your Firm’s Business? This is the third article of a 3 part series on Smart Business Development Strategies for IP Law Firms which discusses how to use data to build more clients for your IP law firm. The first article explains how you can spot your differentiation factor which you can read by clicking here. The second article explains strategies to get more business from existing clients which you can access by clicking here. A few months back, I was in Atlanta, Georgia. During the visit, I met and had a conversation with Jack*, a partner at a well-known law firm. Jack expressed his uncertainty on converting a large organization into a client, who was trying to venture into the domain of Blockchain. *Note: The name of the client is changed to ensure confidentiality. The reason of uncertainty was not the competition but rather his inability to showcase an expertise in the new domain of Blockchain. Since we were talking, he asked whether I had some concrete insights on the domain that he could show to the potential client? This could help increase the confidence of the client in him and would showcase that his firm is investing in knowing more about the industry. And that was the key point. Jack is not the only partner facing this problem. In my several years of experience, I have seen time and again law firms facing issues in converting prospects into clients due to a lack of knowledge in the domain of work of potential clients. These very law firms could have succeeded in converting prospects, had they followed up with factual data constituting concrete insights on the domain of work of a prospect. A method which guarantees a solid conversion rate. How can you go about it? – You ask. Well, let’s walk you through it. What Factual Data Should We Share with the Potential Clients? What factual data to consider while approaching a potential client is a question that perplexes every attorney. It doesn’t matter if their end client is an IP counsel of a large organization or a CEO of a small company, the problem bugs everyone alike. Therefore, it’s important to educate your client about his industry. Here we are not talking about sending anything just for maintaining a touch point but sending really useful information with an intention to genuinely help them. When you help people with genuine intention, they automatically trust you. Are his competitors buying patents? What type of patent reassignments is happening in the industry? How much competitors are investing every year for their IP? Who are the new players (large and small) trying to venture into their domain and filing patents? These insights also increase the opportunities for consulting. Clients would like to know more from you about the patent filing strategies of competitors, where they should spend more money, areas where they should file more patents and the like. A lot of firms are following traditional methods while smart law firms and attorneys are edging their peers by following these routes. Clearly, they’re using these advanced ways of handling their clients – educating them and telling them how they can be better than their competitors. How can you get such information? One way to get this data is to gather and analyze such insights on your own by performing some quick searches on patent databases like Derwent (Formerly Thomson) or Innography. If you feel that you have less time, you can get access to specialized tools or platforms (like one provided by GreyB) that provide such sort of intelligence and information. Sometimes you may not even want an access to a platform and rather solely seek the information you require. In such cases, a partnership with a company that can provide such insights will do the job for you. Are you going to prospect a new customer? Would you like to convert by leaving an impression that you are different from your peers and will add value? If you just nodded in affirmation and you don’t want a complete access to a platform and rather want insights for one or two potential clients, or about what your competitors – law firms, attorneys – are up to, you can approach GreyB. We would be more than happy to help. Click here to get in touch. Authored by: Deepak Syal, Director, Operations. Do You Know about the Smart Patent Strategies Below? How to Defeat A Design Around? How Killing Bad Patents Can Increase The Value Of Your Patent Portfolio? 15 Ways to Avoid Claim Chart Mistakes?